This page describes the divine attendants of the god, the most notable of which were his warrior-companion Eris-Enyo (Strife) and twin sons Phobos (Fear) and Deimos (Terror). Roman writers expanded this list to include a host of warlike abstractions. 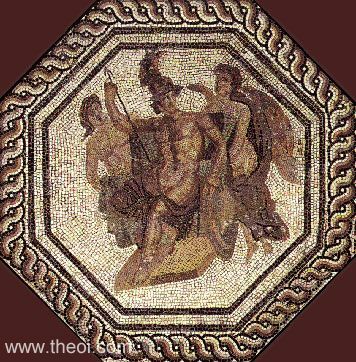 In ancient art Ares' most recognisable attendant, however, was Eros the god of love, who was often depicted playing with the disarmed god's armour in the boudoir of Aphrodite. DEIMOS & PHOBOS The twin gods of terror and fear were close companions of Ares. They drove the god's chariot and assisted him on the battlefield. ERIS & ENYO The goddess of strife, hatred and war was sometimes called sister of Ares and was always described as his close companion. She drove his chariot, riding beside him into battle and raging amongst the hosts of the battlefield. Sometimes Eris and Enyo were regarded as distinct goddesses, two female attendants of the god. KYDOIMOS (Cydoemus) The god of the din of war. He was sometimes mentioned as a third male minion of Ares alongside with Phobos and Deimos. NIKE The goddess of victory was on a few rare occassions described as a minister of Ares. OTHER ABSTRACTIONS Various daimones (spirits) were described as serving in the Thrakian palace of Ares--abstractions such as Rage, Anger, Threats, Death and Valour. "Manslaughtering Ares istrides into battle and Deimos (Terror) goes on beside him, his beloved son, the powerful and dauntless, who frightens even the patient-hearted warrior : these two come out of Thrake to encounter in arms the Ephyroi or the great-hearted Phlegyes, but the two will not listen to prayers form both sides, but give the glory to one side or the other." "Ares drove these [warriors] on . . . and Deimos (Terror) drove them, and Phobos (Fear), and Eris (Hate) whose wrath is relentless, she the sister and companion of murderous Ares." "[Ares] ordered Phobos (Fear) and Deimos (Terror) to harness his horses, and himself got into his shining armour." "Kythereia [Aphrodite] to Ares, stabber of shields, bore Phobos (Panic) and Deimos (Terror), dreaded gods, who batter the dense battalions of men embattled in horrible war, they say with Ares, sacker of cities." "And [depicted] on the shield [of Herakles] stood the fleet-footed horses of grim Ares made gold, and deadly Ares the spoil-winner himself. He held a spear in his hands and was urging on the footmen: he was red with blood as if he were slaying living men, and he stood in his chariot. Beside him stood Deimos (Fear) and Phobos (Flight), eager to plunge amidst the fighting men." "Phobos (Panic) and Deimos (Terror) drove their smooth-running chariot and horses close up to him [Ares when he was wounded by Herakles], and lifted him from the wide-wayed earth and set him in the elaborate chariot and presently lashed on the horses, and they made their way to tall Olympos." "They [the warriors] swore an oath by Ares, by Enyo, and by Phobos (Rout) who delights in blood." "To one place Eris (Strife) drew them all, the fearful Battle-queen . . . Phobos (Panic) and Deimos (Fear) waited on her steps to make their father's [Ares] sister glorious." "The Akhaians pressed hard on the Trojans even unto Troy. Yet these charged forth -- they could not choose but so, for Eris (Strife) and deadly Enyo in their midst stalked . . . Beside them raged the ruthless-hearted Keres (Fates) fiercely: here Phobos (Panic-fear) and Ares there stirred up the hosts: hard after followed Deimos (Dread) with slaughter's gore besprent, that in one host might men see, and be strong, in the other fear." "Already Gradivus [Ares] with forward-straining steeds was trampling the Ephyrean shores . . . Then he orders Pavor (Panic) [Phobos], one of his fearful train, to go before the horses: none more skilled than he to insinuate grasping terror and to steal courage from the heart; voices and hands innumerable has the monster, and aspects to assume at will; all-persuasive is he, and his onslaughts drive cities mad with horror." "Now Zeus armed the two grim sons of Enyalios [Ares], his own grandsons, Phobos (Rout) and Deimos (Terror) his servant, the inseparable guardsmen of the sky: Phobos he set up with the lightning, Deimos he made strong with the thunderbolt, terrifying Typhon. Nike (Victory) lifted her shield and held it before Zeus: Enyo countered with a shout, and Ares made a din." "In hot haste he [Ares] leapt up, and awoke Phobos (Rout) and Deimos (Terror) to yoke his deadly quickrunning car. They obeyed their urgent father. Furious Demos set the crooktooth bit in the horses' mouths, and fastened their obedient necks under the yokestrap, and fitted the neckloop on each: Ares mounted the car, and Phobos took the reins and drove his father's chariot." "Deathly Ares [in Dionysos' war against the Indians] shouted as loud as nine thousand, with Eris (Discord) moving by his side to support him; in the battle he placed Phobos (Rout) and Deimos (Terror) to wait upon Deriades [the Indian King]." "Deimos (Fear) : [Deimos] and Phobos (Fright) and Kydoimos (Din of War), attendants of Ares, the sons of war." "Deimos (Fear): [Deimos] and Phobos (Fright) and Kydoimos (Din of War), attendants of Ares, the sons of war." "Ares drove these [the Trojans] on . . . and Eris (Hate) whose wrath is relentless, she is the sister and companion of murderous Ares, she who is only a little thing at the first, but thereafter grows until she strides on the earth with her head striking heaven. She then hurled down bitterness equally between both sides as she walked through the onslaught making men's pain heavier." "Their fighting work [was woken by] . . . man-slaughtering Ares, and Eris (Strife), whose wrath is relentless." "And with him followed the Trojan battalions in their strength; and Ares led them with the goddess Enyo, she carrying with her the turmoil of shameless hatred." "Dread Eris, marshalling the slaughter of fighting men, cruel spirit, who took the senses and perception out of those fighters who tried to fight in the face of Zeus' son, [Ares] the War God, and the souls of these went under the ground, to the house of Hades." "Her [the Amazon Penthesilea] strong right hand laid hold on a huge halberd, sharp of either blade, which terrible Eris gave to Ares' child to be her Titan weapon in the strife [of the Trojan War] that raveneth souls of men." "So man to man dealt death [in the Trojan War]; and joyed the Keres (Fates) and Moros (Doom), and fell Eris (Strife) in her maddened glee shouted aloud, and Ares terribly shouted in answer, and with courage thrilled the Trojans, and with panic fear the Greek." "To one place Eris (Strife incarnate) drew them all, the fearful Battle-queen, beheld of none, but cloaked in clouds blood-raining: on she stalked swelling the mighty roar of battle, now rushed through Troy's squadrons, through Akhaia's now; Phobos (Panic) and Deimos (Fear) still waited on her steps to make their father's [Ares'] sister glorious." "The Akhaians pressed hard on the Trojans even unto Troy. Yet these charged forth - they could not choose but so, for Eris (Strife) and deadly Enyo in their midst stalked, like the fell Erinnyes to behold, breathing destruction from their lips like flame. Beside them raged the ruthless-hearted Keres (Fates) fiercely: here Phobos (Panic-fear) and Ares there stirred up the hosts: hard after followed Deimos (Dread)." "The black Keres (Fates) joyed to see their conflict [the Greeks and the Trojans], Ares laughed, Enyo yelled horribly. With corpses earth was heaped, with torrent blood was streaming: Eris (Strife incarnate) o'er the slain gloated." "In deadly mood then charged they [the Greeks gaining entry to Troy] on the foe. Ares and fell Enyo maddened there: blood ran in torrents." "Deathly Ares [in Dionysos' war against the Indians] shouted as loud as nine thousand, with Eris (Discord) moving by his side to support him." "Battlestirring Ares in mortal shape, with Enyo by his side . . . has armed himself against Dionysos at Hera's bidding and supports the Indian king [Deriades who warred against the god]." Nike was on a few rare occassions described as an attendant of Ares. In the mosaic above, she is depicted standing beside his throne. "Ares . . . O defender of Olympos, father of warlike Nike (Victory)." "Barren forest [of Thrake], the sacred haunts of Mars [Ares] . . . where on the far slopes of Haemus his savage mansion is ringed by a thousand furies . . . Fit sentinels hold watch there: from the outer gate wild Impetus (Passion) leaps, and blind Nefas (Mischief) and Irae (Angers) flushing red and pallid Metus (Fear) [Phobos], and Insidia (Treachery) lurks with hidden sword, and Discordia (Discord) [Eris] holding a two-edged blade. Minis (Threats) innumerable make clamour in the court, sullen Virtus (Valour) stands in the midst, and Furor (Rage) exultant and armed Mors (Death) [Thanatos] with blood-stained visage are seated there; no blood but that of wars is on the altars, no fire but snatched from burning cities."